Earlier this year our Friends at Equestria Daily quoted an article from USA Today regarding Hasbro’s new “fan series” of My Little Pony: Friendship Is Magic toys, called Guardians of Harmony. This line of full-sized action figures stands out because the designs are not only expansions of what we’ve seen in the TV series, but they were also inspired by many of the stories and characters in IDW’s popular comic book tie-in series. In fact, some of the designs are based on ideas that Bronies have been discussing only in whispers! 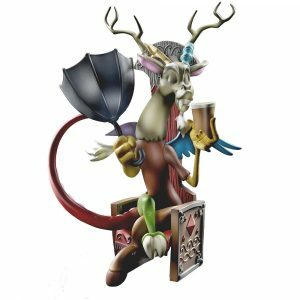 Besides some of the well-known characters, Guardians of Harmony includes figures of popular characters like Discord, a grown-up armored version of Spike the dragon, and even Weird Al Yankovic himself in pony form as Cheese Sandwich! Word is out that IDW may be creating a new line of comic books to include the Guardians of Harmony story situations, but we’ve yet to see that come about. Most of the new designs are available now at Amazon and other top toy destinations. One, Two! Monkey Punch Through! “A burnt-out boxer named ‘Knuckles’ is being tracked by the Mexican mafia, but when Thunder Monkey arrives, whose side will Knuckles choose? 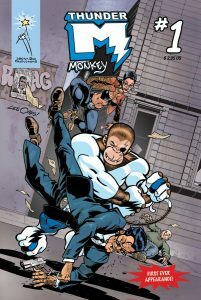 Everyone wants to know who Thunder Monkey is, and what is his original power!” After a a successful Kickstarter campaign, creator Lee Oaks presents the first black & white issue of Thunder Monkey, published by Dream Bug Productions. So who IS this super-powered simian and what does he seek in Summercity? Find out by checking out the latest issue over at Atomic Avenue. image c. 2016 Dream Bug Prod. 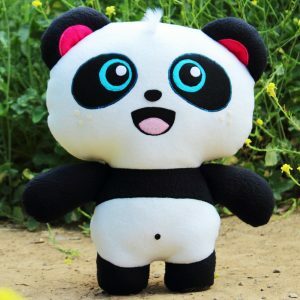 The creators of Fat Rabbit Farm (which we reviewed here previously) have a new line of graphic products called Pandi the Panda. He started life as a Facebook Messenger sticker, but since then he’s expanded to much more — including t-shirts, prints, plushies, and other illustrated stuff. “Pandi the Panda is a lifestyle brand reminding us all to enjoy life, have fun, be adventurous, and to pursue what makes you happy. We are proud to share with you designer, comfy wearables and products that encourages you to embrace this lifestyle.” Visit the official web site to find out more and see the current designs. Disney Animation recently decided to release the first new Zootopia-themed merchandise that we’ve seen in a while. It’s a new “hidden object” phone-app game called Zootopia: Crime Files. According to a write-up at Adweek.com, “The hidden object game asks players to help Judy Hopps and Nick Wilde solve cases by completing hidden object scenes. In each normal scene, players are asked to find items on a list, which may include pieces of evidence or clues for the current case. Users can access hints if they need help finding objects.” The article goes on to describe the types of game play in much more detail. 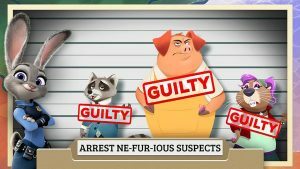 Lots of new Zootopia characters are introduced in the game — most (but not all) of them quite nefarious! The game has been available as a download for the Apple platform for a while, but now with the official launch it’s also available for Google Play, PC format, and Amazon Underground as well. While we were at San Diego Comic Con, one of the categories we saw (of course) was lots of fan stuff and official tie-in stuff for My Little Pony: Friendship Is Magic. (Yes it’s still around and Yes it’s still popular!) One of the more interesting and unusual of the latter is The Wonderbolts Academy Handbook, compiled by Brandon T. Snider and published by Hachette / Little Brown Books. “Attention cadets! This Wonderbolts Academy Handbook once belonged to Rainbow Dash! 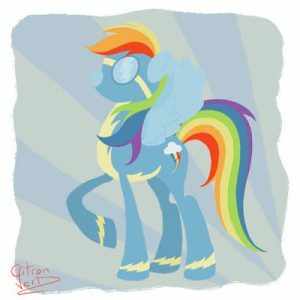 Along with valuable information on how to become a Wonderbolt, our stellar Pegasus pony added her own notes to help you along. The lessons in here have been passed down for generations, with each generation refining these lessons to better serve you and the institution. You will have much to learn and all staff and senior members of the Wonderbolts are more than willing to guide you. Good luck, have fun, and stay focused!” You should focus on Barnes & Noble to order yourself a copy. 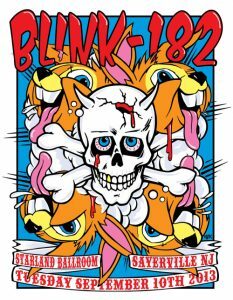 Frank Kozik is a world-famous graphic artist who has often been credited with single-handedly reviving the silk-screened rock’n’roll concert poster as an art form. A self-described “military brat”, after his honorable discharge from the air force he dedicated himself to art — completely self-taught as well. He has since become known not only for his posters and graphics but also for several lines of unique toys and action figures based on his designs. And yes, “funny animals” (and disturbing animals!) are often part of his work. Back in the day, he even started his own record label! Take a look at his web site to see more of what he’s been up to over the years and what’s coming next. Be prepared! 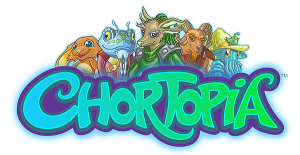 Chortopia is the name of a new educational game and phone app created by Aurasync. It has one basic goal: To help parents motivate their young children to make a habit of completing their household chores by turning those chores into “advenchores”. Kids visit the magical land of Chortopia, where they meet a variety of anthropomorphic and mythical creatures who need the children’s help setting things right in the land — by the kids completing various household tasks, of course. After the advenchores are done, kids can “collect” the various characters they have helped out as friends who will help the kids win various games that are also part of the app. Chortopia is available now at the Apple App Store, but you can also visit the Chortopia web site to find out more about it and see some introductory videos from YouTube as well. Robert X. Burden is an artist who has taken an unusual subject and really run with it. 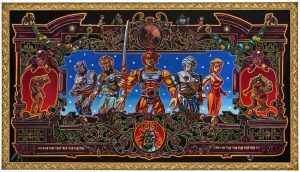 He paints complex, highly-detailed, collage-like but highly-ordered pictures based on classic toy action figures from movies and TV. As such, of course he paints a lot of science fiction subject matter. And yes that includes a lot of Furry subjects, like the Thundercats and Teenage Mutant Ninja Turtles. Visit his web site to see more of what he’s done — and spend some real time looking slowly through all the detail he puts in. Space Cats In Space! is the name of a new animated computer game, currently under development. They have a Kickstarter campaign in place to try and finance the next step in the process. 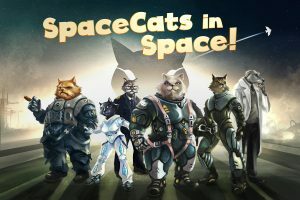 “An advanced twin-stick shooter space epic, SpaceCats In Space! Follows the kingdom of Meowfyre’s rebellion against the dogs of the Grolich Empire. Bomber strikes, wingman assistance and RPG-like leveling are all tools at your disposal in the battle to stop Oberluft Kommandant Arnuld Von Schloss and the vast Grolich war machine. Featuring animated cutscenes and full voiceover to immerse you in a World War II inspired space battle of cats versus dogs!” This is not the most “serious-minded” of fighting games out there… if the title wasn’t a giveaway, check out the intro video at the Kickstarter page! (Also this is obviously more for “cat people”!) As we write this there is just over a month left in their current crowd-funding campaign.